Maddie Downing goes in for a score against Covington in a game earlier this season. Downing is one reason the Lady Patriots are 15-1 this season and ranked fifth in the latest Division IV state poll. Both the Versailles and Tri-Village girls basketball teams hold the same rankings in this week’s state girls basketball poll as they did a week ago. The Lady Tigers added a 49-43 win over St. Henry to their now 11-3 record before the poll voting took place, but continued to hold the No. 6 spot in Division III when the poll was released on Tuesday. Versailles received one first-place vote and totaled 78 points in this week’s poll. The sit behind top-ranked Columbus Africentric (14-0), which received 22 first-place votes and earned 226 points. No. 2 is Findley Liberty-Benton (14-0) with 189 points followed by No. 3 Waynesville (13-0) with 151 points, No. 4 Ottawa-Glandorf (16-1) and 130 points and No. 5 Berlin Hiland (13-1) with 114 points. 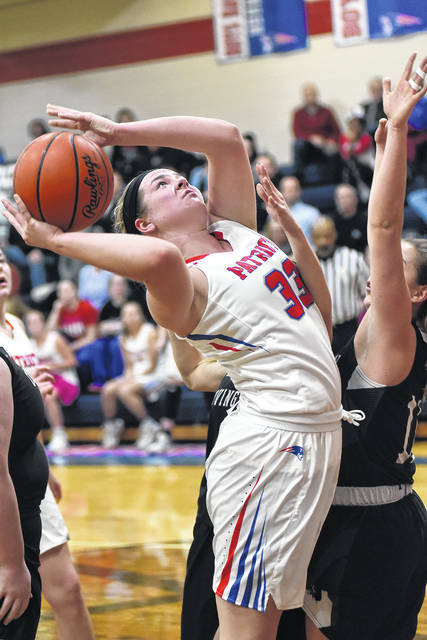 In Division IV, the Lady Patriots hold steady at No. 5 for the third consecutive week. Tri-Village added wins over Cedarville (45-39) and National Trail (54-13) to improve to 15-1 on the season. They received one first-place vote and totaled 112 points for the week. Fort Loramie (14-1) continues to lead the Division IV rankings with 13 first-place votes and 208 points. Minster (15-1) sits in the No. 2 spot with two first-place votes and 179 points. At Nos. 3 and 4 are Cornerstone Christian and Fairfield Christian respectively. Cornerstone Christian (14-1) received three first-place votes and earned 149 points, while Fairfield Christian (14-0) received one first-place vote and earned 126 points. The Division I and II poll leaders remained the same again this week with Pickerington Central retaining the top spot in Division I despite some other teams moving in the rankings, and Carroll remains strong at the top of Division II. In Division I, Pickerington Central (12-1) received 12 first-place votes and totaled 197 points with Canton McKinley moving up one spot to No. 2 with one first-place vote and 156 points. Centerville also moved up in the rankings to No. 3 with two first-place votes and 153 points. Toledo Rogers sits well behind Dayton Carroll in Division II. The Patriots (15-0) received 15 first-place votes and 215 points with Toledo Rogers (10-2) collecting three first-place votes and 160 points. New Philadelphia (13-0) is ranked No. 3 right on the heels of Toledo Rogers with three first-place votes and 159 points. Others receiving 12 or more points: Akr. Hoban 30. Eastlake N. 26. Youngs. Austintown-Fitch 20. Aurora 12. Others receiving 12 or more points: Youngs. Mooney 18. Chillicothe Unioto 15. Tipp City Tippecanoe 15. Beloit W. Branch 12. Others receiving 12 or more points: Albany Alexander 25. Sardinia Eastern 17. Elyria Cath. 14. Newton Falls 13. Others receiving 12 or more points: Stryker 14. Shadyside 14. Cortland Maplewood 13. Newark Cath. 12.